The Kashmir conflict, since the beginning, has posed many challenges to the Indian state and the narrative it propounds. Even though experts and academics have often tried to focus on the security dimension of the conflict, the failure to link governance with conflict has not received much attention. It is taken as a given that governance will take a lead once the security dimensions are resolved. Security gets prominence over governance then. There is no denying that Jammu and Kashmir, as a federal unit of the Indian state, suffers from lack of good governance.The author delves into the question whether there is a link between the mis/rule in Jammu and Kashmir (J&K) by the Indian state and aggravation in conflict. 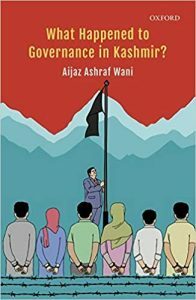 The book under review grapples with this question and argues that governance was used by the Indian state to suppress rather than accommodate the rising tide of dissent in J&K. Not only governance but ideological, cultural, social, legal and other resources were used by the Indian state to resist/create social consent (p. 3). Wani argues that the factors that ail the governance system in J&K are not only internal but also external. The primary internal factors are conflict amongst the three regions of J&K, and externally ‘colonialism’ and ‘nationalism’ took precedence (p. 2) . Wani further argues that many of the present predicaments of the State are a result of the way it was governed by New Delhi with the help of ‘client governments’ (p. 1). After 1947, the model of governance in J&K was based on the Naya Kashmir Manifesto which ascribed to the socialist model of development. This State-centric approach of governance, according to the author, was the result of the diversity and absence of a ‘single organic entity’ within both India and J&K. In India, the State-centric approach to governance was redefined post-liberalization and the markets have more of a role to play now. In the case of J&K, the author says, liberalization did not redefine governance, which is eclipsed by security concerns, and the State still permeates every aspect of life which makes every other form of engagement peripheral. He argues that the modern state is not only ‘Janus faced’ but is in a continuous dialogue with multiple actors, structures and groups, fulfilling some aspirations of the people and at the same time suppressing others. The State, the book notes, has always tried to ‘engage’ with political problems (from its own perspective) without being sincere about ‘resolving’ these problems. Governance in the State was primarily concerned with maintaining peace, law and order, and creating/maintaining a statist narrative at the cost of political aspirations and democratic rights of the people. The author argues that material fulfilment was considered as a remedy for all that was wrong in J&K. Corruption, deception, development, subsidies, coercion and farce elections became tools of governance in the State. The poor financial condition of the State made all these tools more attractive. In saying so, Wani makes a far-reaching polemical argument that governance in the State has always been scripted by New Delhi within a broader framework of ‘coercion and consent’. The book argues that the contestation over the special status of J&K, and of identity within the three regions has also complicated governance in the State. Mis-governance in the State did not become a burning issue during the initial decades due to the ‘perception of mass contentment’ (due to land reforms and subsidies), innocence (p. 57) and illiteracy among the masses. Mis-governance, over decades, combined with many other factors led to insurgency at a particular point of time. The later chapters discuss governance under each Prime Minister (PM)/Chief Minister (CM) in the State from Sheikh Abdullah to Farooq Abdullah. It can be gauged that by governance, the author means different policies executed by these leaders and the success of the execution of such policies and major crisis/challenges faced by them during their respective tenures. The chapter on Sheikh Abdullah discusses land reforms, cooperatives, continuation of regressive taxation of Dogras, authoritarian and stubborn Sheikh, integrationist Indian state, corruption, cooperatives, financial crisis and increasing communalization of the State. He concludes, ‘Sheikh was a good fighter but a failed administrator, which is abundantly reflected in the governance of the period’ (p. 137). After Sheikh’s dismissal, Bakshi was installed. The chapter on Bakshi begins by calling him a good administrator and talks about how he abolished regressive taxation, brought in food subsidies but at the cost of integrating Kashmir with India, took dissident Ladakh and Jammu regions into confidence, started a ‘cultural project’ which mostly included state patronage of the arts (in order to create social consent) and formed a ruthless ‘peace brigade’. Meanwhile, Bakshi was also recalcitrant on certain points on the question of integration. By the time one finishes reading the chapter, Bakshi and his administration come through as being corrupt and ruthless. After Shamsuddin’s short stint as Prime Minister of J&K, GM Sadiq was installed. Wani portrays him an honest man with a soft corner for the pro-secessionists. He liberalized trade and freed the Press from unnecessary restrictions. He writes that Sadiq even disbanded the ‘peace brigade’ of the Bakshi era, built roads, and had a robust policy on health, education, recruitment, infrastructure and electricity. During his era the Pandit agitation took place and the Gagendragadkar Commission was appointed to investigate grievances of different communities. It was during his era that more integration with India took place. Most of the chapter is a rhetorical monologue on the honesty and achievements of Sadiq and says that ‘Indeed, Sadiq was a man of principle, but in the wrong place and at the wrong time’ (p. 264). In the last section of the chapter the author says that Mir Qasim followed on the path of Sadiq. The last chapter deals with the return of Sheikh Abdullah as the Chief Minister of the State and the succession of Farooq Abdullah after Sheikh’s death. This chapter discusses the development works done during Sheikh Abdullah’s tenure. It shows him as a person who was power hungry, corrupt, deceitful and authoritarian. Despite being weakened by the Central Government, Sheikh still resisted the more integrationist policies of Indira Gandhi. Therefore, after Sheikh’s death, Farooq was annointed as his successor in J&K. Due to Farooq’s eccentric nature and apathy to politics, the Central Government thought it would be easier to tame him. As Farooq resisted these pressures, Ghulam Muhammad Shah was installed. Farooq realized that he could not survive without help from Delhi and therefore signed an accord with Rajiv Gandhi. The accord, according to the author, was a major turning point in the history of conflict in J&K since it blocked an outlet for expressing regional aspirations/discontent. The book also briefly delves into separatist politics in the State since its inception. The main argument of the book is that the respective governments in the State used all the available means/resources (including governance) to support the Indian statist narrative at the cost of the real political aspirations of the people. This argument is as old as the Kashmir conflict itself. On a theoretical level, the author fails to explain how he defines governance in the first place. He fails to explain whether genuine political aspirations can be reduced to good governance or there is more to it. Or, is there a possibility that more transparency, corruption free government, free and fair elections will resolve the Kashmir conflict? A more nuanced approach would have made this book interesting and valuable. At this moment, it remains, as is the problem with most of the academic literature on Kashmir, a perfunctory analysis. Having said that, the book is historical in nature and rich in ‘references’. Waqas Farooq Kuttay is a Ph.D Candidate at the Department of Political Science, Jamia Millia Islamia, New Delhi. Book Name: WHAT HAPPENED TO GOVERNANCE IN KASHMIR?